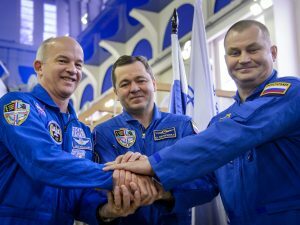 NASA Astronaut Jeff Williams broke NASA Astronaut Scott Kelly’s record today for the longest cumulative time spent in space for a US astronaut. Jeff is on his fourth mission to space, which include one Space Shuttle mission and three long duration missions to the International Space Station. For this current mission Jeff launched on March 18th, 2016 with Cosmonauts Aleksey Ovchinin and Oleg Skripochka aboard their Soyuz TMA-20M vehicle and docked at the station 6 hours later. Jeff later took command of the station just before the departure of previous commander NASA Astronaut Tim Kopra. Jeff previous flew on STS-101, Soyuz TMA-8 (Expedition 13), Soyuz TMA-16 (Expedition 21/22). Jeff will return to Earth in September having surpassed 533 cumulative days in space.